I think you have seen the mobile versions of popular web portals and blogs .Similarly you can also create create a mobile version of Blogger or WordPress blog . There are different methods and each depend on the blog platform . Mobile version of a WordPress blog . First of all you have to create a subdomain for your blog , say m.yourdomain.com. Your WordPress blog should be re-directed to this sub domain when accessed on a mobile phone . For this , you have to identify mobile browser UA string snippets, which can be done using PHP scripts .. There are plugins in WordPress for automatic re-direction to mobile versions . These services Deviceatlas.com and WURFL can be used for mobile device detection . Check out Andy moores PHP script to detect mobile phones . Here you can generate custom PHP script to choose the mobile browsers and the domain to which it should be re-directed .Download the PHP the code and paste it at the very top of your header.php file ( This can be found in your theme directory ) . Apart from this , Andy Moore also has a WordPress plugin for mobile versions of WordPress blogs. The best service that can create a mobile version of WordPress blog is Mofuse . Mofuse is completely free and they have an easy to use mobile site builder for custom design of your site . On default , you will get a .mofuse.mobi domain after successful registration . This can later re-directed to your custom domain using the Mofuse dashboard settings . 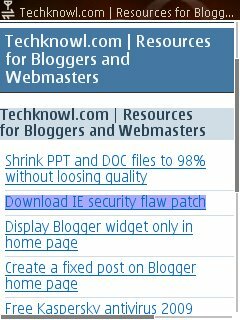 For eg: techknowl.mofuse.mobi can be re-directed to m.techknowl.com. A CNAME record (m.techknowl.com) should be made on your DNS control panel and it should be pointed to techknowl.mofuse.mobi . So a visitor at m.techknowl.com(Desktop) will be redirected to techknowl.mofuse.mobi . For mobile phone redirection , you can use Mofuse WordPress plugin . Just enter your mofuse mobile site name and your sub domain will be redirected to it . Earn Revenue from mobile site using Google adsense and Admob . Though we can create a mobile version of the Blogger blog , re-direction to mobile site is not possible as the execution of server side scripts like PHP are not allowed . So here also we can make of Mofuse for the mobilization of Blogger . Blogger custom domain users can create a sub domain and change the CNAME record to point Mofuse. These sites should be promoted independently as they are not available on direct mobile access . Now I have a reason why should I also setup a mobile version for my Khal Tamar webshop.